An hour south of Lubbock, the town of Lamesa lives up to its name, which translates from Spanish as “The Table.” Since 1948, the horizon of dusty cottonfields has been broken by the big screen of the Sky-Vue Drive In theatre. Sam Kirkland, the present-day owner, started jerking sodas at the bar 55 years ago. Back in those days, local bands used to set up on the roof of the projection booth and play to the parking lot, as it filled up for a weekend movie. Among those bands were an aspiring yodeler named Don Walser and a bespectacled Lubbock native named Buddy Holly. Fast-forward fifty years, to 2005. The Sky-Vue was still going, but the band tradition had blown away like the topsoil. 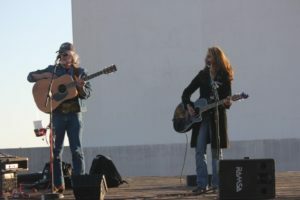 Until a local poet and professor named Connie Williams started Forrest Fest – named not after a nonexistent forest, but after a park south of downtown. Connie recruited me to come play on the roof of the Sky-Vue. 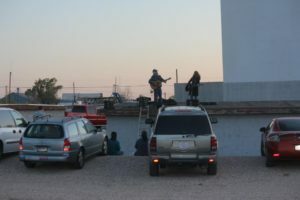 It involved hauling my PA up a ladder and standing alone against the sunset, while the prairie wind whistled through my jacket and across my microphone. As I launched into an entire set of car songs, I suggested to my listeners that they honk if they loved Steve. From my perch, it would be easier to hear than applause. Then, inspiration struck. I got to “Road Hog,” a singalong that makes fun of people who drive SUVs. I turned it into a Honkalong, and the parking lot went wild. The gig and the Honkalong have turned into an annual tradition. Like Bigfoot or the Ivory-Billed Woodpecker, though, the Honkalong was a phenomenon that proved elusive to capture. This year, however, Phillip Abbott stationed a digital recorder down in the parking lot while I recorded the mix off the sound board up above. I digitally enhanced the car horns, mixed them in with my tracks, and at long last, I have a live recording. Adding rhythm guitar and harmony this year on the rooftop was western singer Evelyn Roper of Gunnison, Colorado. Enjoy listening to the Honkalong below, and give Sam a Howdy from me if you’re going through Lamesa. There’s time to catch a double feature and still make Amarillo by morning.